John Kerry and Iranian Foreign Minister Mohammad Javad Zarif. 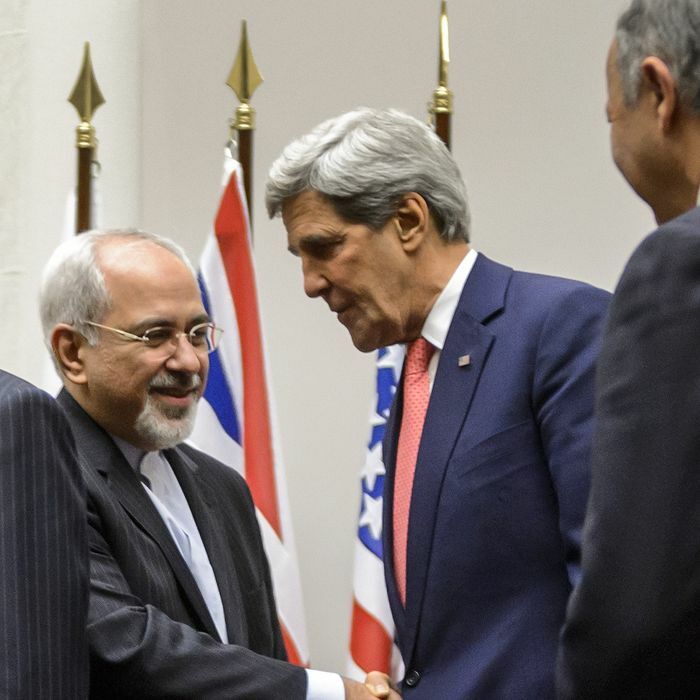 After months of secret face-to-face meetings between American and Iranian officials and weeks of public talks that included diplomats from Russia, China, France, the UK, and Germany, Iran has agreed to drastically downscale its nuclear program for six months. Negotiators intend to use that time to come up with a more comprehensive, permanent deal to ensure that Iran’s nuclear program will only be used for peaceful purposes, not weapons-making. The accord was signed in Geneva at 3 a.m. today. It requires Iran, which has long avoided international monitoring of its nuclear program, to stop enriching uranium beyond five percent, which is enough to produce energy. The country’s current stockpile of uranium enriched at twenty percent, which is close to the level needed to build a bomb, is to be diluted or converted so that it can’t be used for military purposes. Iran also agreed to curb the capabilities of the centrifuges it uses to enrich uranium and to not build new enrichment facilities. In exchange, Iran will receive $6 to $7 billion in relief from the sanctions that have crippled the country’s economy. A statement from the White House explained that the relief “is a fraction of the costs that Iran will continue to incur during this first phase under the sanctions that will remain in place. The vast majority of Iran’s approximately $100 billion in foreign exchange holdings are inaccessible or restricted.” The relief will happen via an executive order, avoiding the struggle of getting Congress to approve a deal that does not eliminate Iran’s nuclear program entirely. In a speech from the White House, President Obama praised the agreement: “There are substantial limitations which will help prevent Iran from building a nuclear weapon…Simply put, they cut off Iran’s most likely paths to a bomb.” However, he noted that he could reinstate the eased sanctions if Iran failed to hold up its end of the current bargain or reach a final deal. “Nothing will be agreed to unless everything is agreed to,” he said.